Toggles the display of layers in PDF underlays. Selects a different PDF underlay that is in the current drawing. Type a search string in the search field. Only layers of which part of the layer name matches the search string are listed. You can use wildcards (? or *) in the search field. 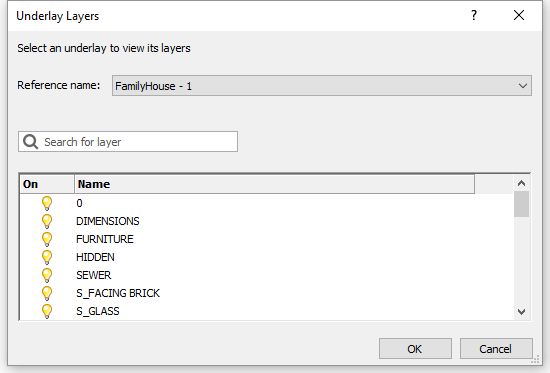 Click the column title to sort the layer list by display. Click the icon to turn the display of a layer on/off. Click the column title to sort the layer list by name.